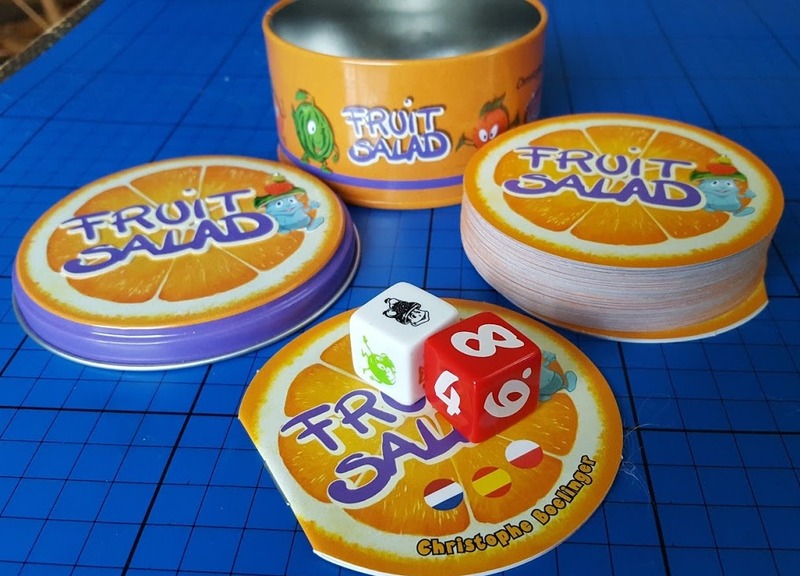 Fruit Salad is an incredibly quick to grasp family game which is played using a set of 60 circular playing cards and 2 special dice. My 7 year old really likes this one, and as each game needs barely a corner of the table, takes 2-4 players and lasts only around 15 minutes, it's a great game for playing when you have an odd half hour to fill. Fruit Salad is recommended for children aged around 6+ and I think that's right because it is fast and competitive, and if I played with any commitment I'd still frustrate my newly 6 year old as he simply wouldn't be as fast as me. My 7 year old though plays on a pretty even par, and can beat me regularly. 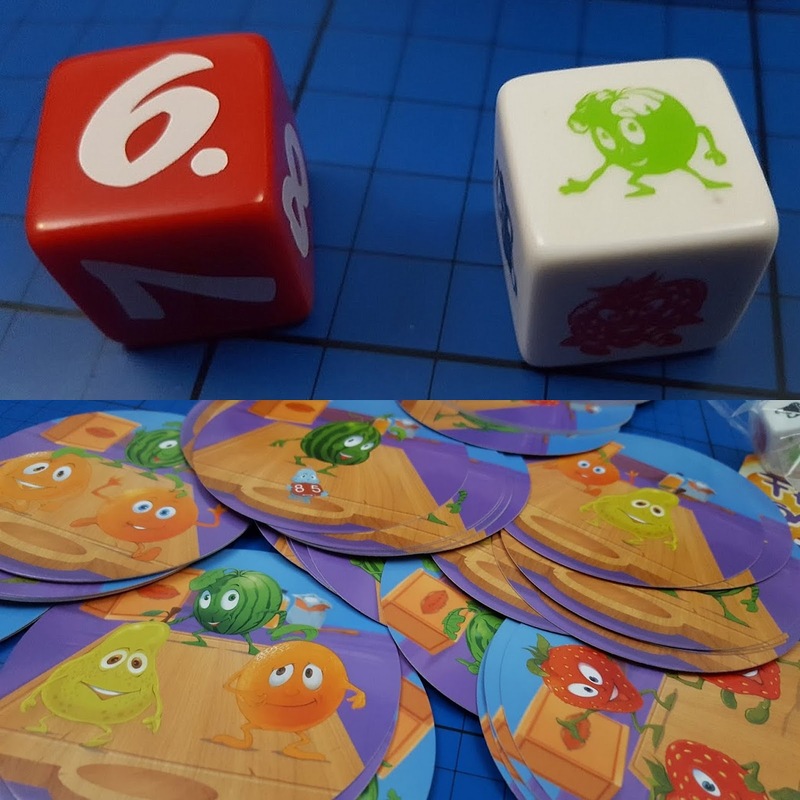 To play use the special dice to select a type of fruit and a number. Players then add cards to a stack in turn. 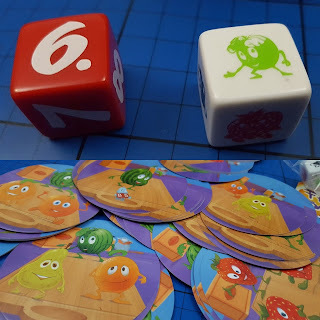 You must watch as cards are played until you think the required number of the fruit shown by the dice are in the stack. First to cover the stack with their hand has to state what they are claiming, and then the cards are checked. If they are right the other players get distributed those cards however the winning claimant chooses, if they miscounted then they have to keep the stack. The winner is the first player to have an empty hand, or to correctly claim 4 stacks. Gameplay is a bit more exciting as some cards have little fruity symbols on the bottom which change either the fruit or the minimum number required - this is where memory really comes in useful! Fruit Salad is available now at all good toyshops and online, including Amazon. 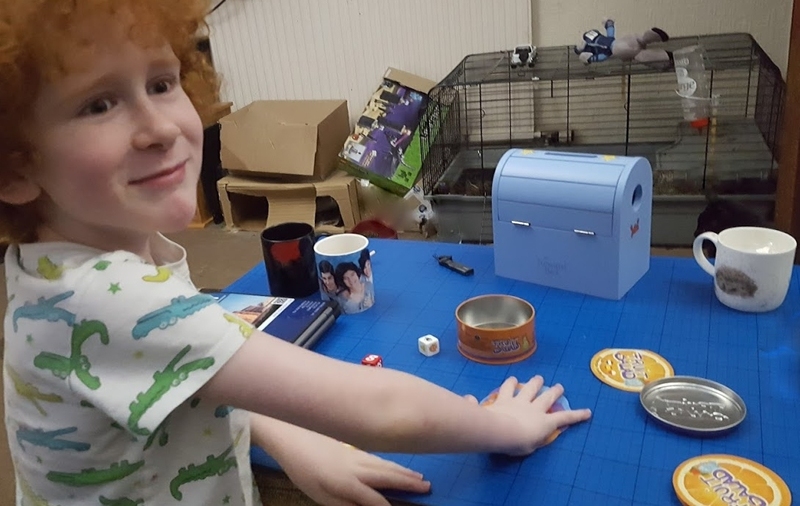 To find out more about the games that Esdevium distribute, take a look at the Esdevium Games website. We were sent our copy of Fruit Salad for review.